Ophuls didn’t originate the project and wasn’t even the studio’s first choice as director. He was forced to work with a screenwriter he didn’t want (Cecil Saint-Laurent), a bombshell actress he had minimal respect for (Martine Carol), and was required to shoot in CinemaScope, color, and stereo, none of which made him happy according to his son Marcel Ophuls. The net result is pure Ophuls, his signature recognizable in nearly every scene and, despite its very poor initial reception, one hell of a movie. Ophuls is the then-and-now master of the tracking camera and he indulges his sinuous obsession as much here as in “The Earrings of Madame De…”(1953). As his camera tripped along with the dancers of “Madame De…” here it twirls with the acrobats and clowns of the circus in which the title character performs. The real Lola Montez was an infamous courtesan who toured/tore through multiple continents, parlaying a mediocre combination of dancing, singing, and acting skills into a spectacular piece of performance art. 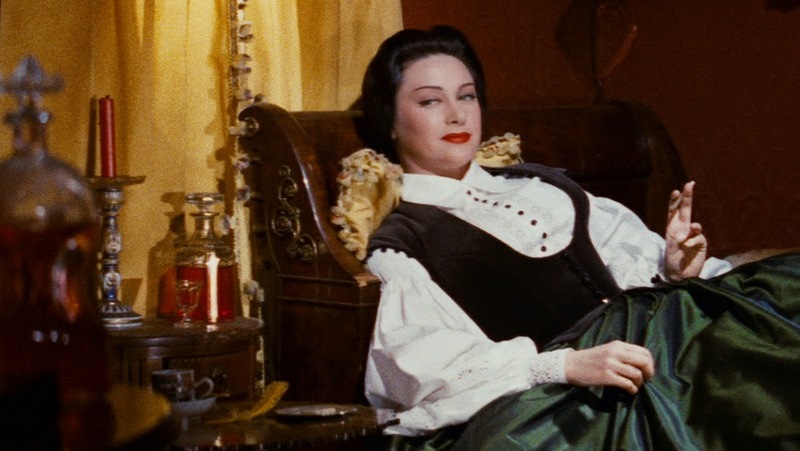 Born in Ireland, she transformed herself into a Spanish seductress and later the Countess of Landsfeld, a title granted her by her lover King Ludwig I of Bavaria (played perfectly in the film by Anton Walbrook), one of the many conquests that helped make her Lola Montez. In the film, Ophuls spins Montez’s carefully cultivated legend into a legend of his own, one so far removed from the original script that Saint-Laurent was only given a “based on the novel by” credit even though there was no novel. Ophuls’ Lola spends her latter days as the star attraction of a cut-rate circus that exploits her scandalous life story for mere pennies. The ringmaster (Peter Ustinov) teases the crowd with tales of her bawdy exploits while Lola, seldom doing anything other than sitting center stage and being Lola, flashes back to various moments in her life, ones that bear only a passing resemblance to the version being recounted by the ringmaster. The flashback structure is awkward, downright clunky at times, but Ophuls’ mise-en-scene stitches everything together. Cinematographer Christian Matras, Ophuls’ collaborator on his last several films, and his camera crew built up marathon endurance with a winding camera that constantly doubles back on itself and opens up new spaces that make sets look infinite. Ophuls may not have wanted to work in CinemaScope (then 2.55:1) but he exploits it to tremendous advantage with action constantly taking place at the edges as well as the center. What better environment for that than a circus? Perhaps to show his resistance, though, Ophuls masks several scenes, forcing them back to Academy ratio or something in between. Even more notably he explores the vertical as much as the horizontal, and a camera that starts on the ground is likely to finish above a chandelier, revealing new planes of action, adding new characters to each scene as it rises. This is real 3-D technology. Much has been made of the shortcomings of lead actress Martine Carol, cast primarily for her ability to fill out a dress and to fuel the fantasies of adolescents of all ages. It’s fair to say that she has limited range, but the role doesn’t require much. Under the camera's gaze Lola is an object of curiosity, and even her personal recollections don’t reframe the story from her perspective. I’m not sure this does justice to the historical figure who has been adopted as a feminist icon in some circles. One of the few moments when we see that “What Lola wants, Lola gets” is her aggressive seduction of a rosy-cheeked university student/leftist revolutionary (Oskar Werner, later to be Jules to Jim) who, like every man who has shared her company, becomes devoted to her for life. Much of the rest of the time, Lola is oddly passive or at least restrained. Carol doesn’t bring the white-hot intensity to the role that one might expect, but her reserved performance is well-suited to Ophuls’ purposes and it’s not her fault that unimaginative audiences laughed when she played a 16 year-old version of herself. Though Ophuls appears fond of Lola, he depicts her life as more tragedy than triumph. Undone by historical forces beyond her control, she is forced to become a sideshow attraction, now no longer in charge of crafting her public image. In the film’s grotesque finale, Lola stands in a cage, hands extended through the bars so that men who have ponied up a dollar apiece can kiss her. Ophuls’ roving camera, of course, cuts a path through the crowd of horny gawkers, pulling away from Lola and ultimately closing the curtain on the film and her life. “Lola Montès” was, to say the least, not well received. After an infamous and rowdy debut screening, it was savaged by critics both as lousy art and as a waste of money. It was, to date, the most expensive European production and failed to recoup its budget. The desperate studio heads decided that the best solution was to chop it down to a 90-minute mutilated and defanged version that might play a little “easier” to a broader demographic. Harvey Weinstein must get teary-eyed just thinking about it. After lingering for more than a decade in this pathetic state, the film was purchased by producer Pierre Braunberger who went to painstaking efforts to restore the film as close to its original version as possible. Braunberger died in 1990 but later his daughter Laurence picked up the project. Over the last several years, the film has gone through extensive digital restoration which has reconstructed its original color and stereo track. It was released in its new/old state in 2008 and was a hit at Cannes and later in a theatrical run. 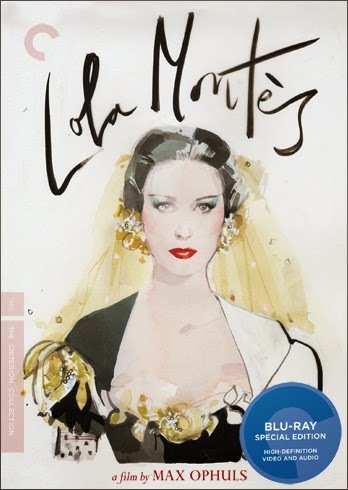 Now Criterion has made “Lola Montès” available in its original form (or at least as close as can be) on both SD and Blu-Ray and it is a joy to behold. Each scene is an audio-visual treat unto itself, worth soaking in over and over again. Saddled with a writer, a star and a format he didn’t want, Ophuls produced a personal work with the technical polish of a true virtuoso. In other words, an auteur. With such an intricate restoration, there are occasional inconsistencies in the image quality but overall the transfer is excellent. The image resolution on the Blu-Ray is a solid step up from the SD release, making up for the only minor weakness of the standard transfer. Colors are even sharper than on the SD which was already quite fine. According to the Criterion insert booklet, “Lola Montès” was recorded in 4-track magnetic stereo, an early surround sound technology then only available with CinemaScope. To capture the original quality, Criterion has presented the Blu-Ray in DTS-HD Master 3.0. I didn’t notice a major difference in audio quality between the Blu-Ray and the SD release. The music sounds perhaps a bit sharper but otherwise they’re fairly similar. The Blu-Ray includes optional English subtitles. This Criterion package doesn’t offer quite as many extras as we might hope for such an important film, but what we have is still respectable. The film is accompanied with a commentary track by Susan White, author of “The Cinema of Max Ophuls.” White also provided commentary for the Criterion releases of Ophuls’ “La ronde” (1950) and “The Earrings of Madame De…” Her knowledge is extraordinary detailed. She often falls into the “play-by-play” mode of commentary which isn’t my favorite, describing each movement as it happens, but her analysis is so penetrating that it works well in this case. The longest extra is a Oct 26, 1965 episode of the French TV program “Cinéastes de notre temps,” a long-time Criterion staple. The episode, titled “Max Ophuls ou le plaisir de tourner” (53 min.) is directed by Michel Mitrani and features clips from Ophuls’ films (in dreadful condition, helping us appreciate the glory of modern restoration) and extensive interviews with Ophuls’ crew and cast from several films, among them Danielle Darrieux, Simone Simon and John Houseman. “Max by Marcel” is a new short feature (2009, 32 min.) by Max’s son, filmmaker Marcel Ophuls. It discusses the troubled production history of “Lola Montès” from an insider’s perspective (whether that makes it more or less reliable is up to you to decide). Marcel worked as an assistant director on the film. I thought this was a much more interesting feature than the “Cinéastes” episode. The DVD also includes silent footage (1 min.) of Martine Carole showing off several hair styles from the film. It originally aired on French TV on Aug 3, 1958. Finally, the collection wraps with a Re-Release Trailer from 2008 by Rialto Pictures. All extra features are presented in HD. The insert booklet features a superb, incisive essay by Gary Giddins, one of the best essays Criterion has ever offered. When I grow up, I want to write like that. 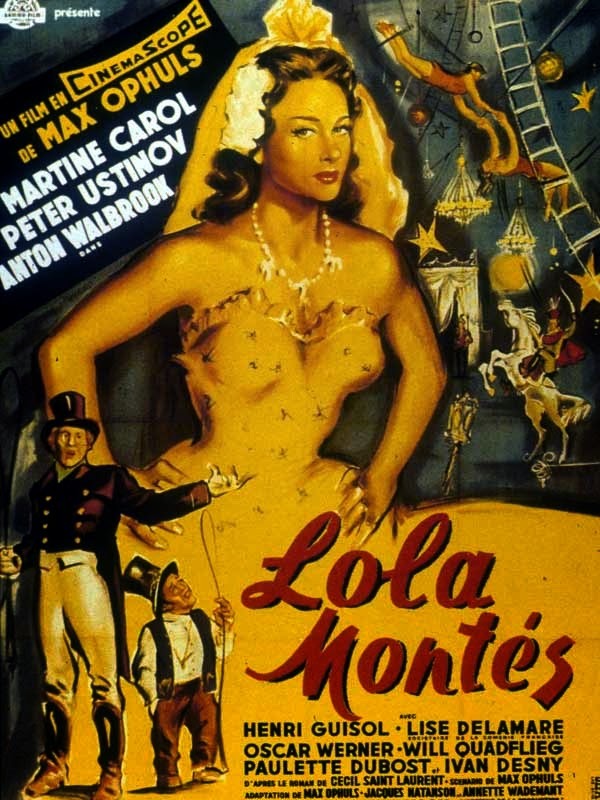 Ophuls was deeply hurt by the poor reception of “Lola Montès”as well as its manhandling by studio hacks, and it turned out to be his final film. Ophuls died in 1957 from heart disease and wouldn’t live to see the film restored both physically and critically. Andrew Sarris famously proclaimed “Lola Montès” to be “the greatest film ever made.” That’s a difficult position to defend, but it’s certainly one of Ophuls’ finest moments. And thanks to an extensive, decades-long restoration effort it has been preserved for new generations. Unlike the Lola of the film, “Lola Montès” has been set free to bask in well-deserved glory forever.